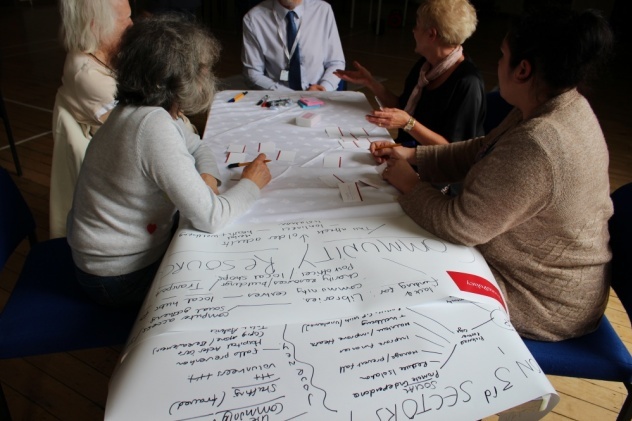 A number of older people and staff from Age UK Lancashire participated in the half-day co-design workshop run at Lancaster. 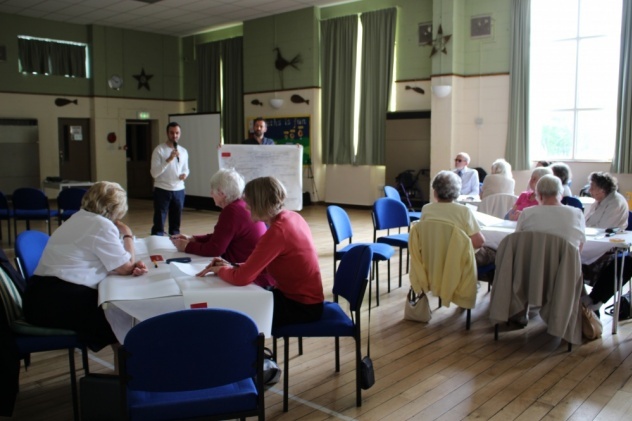 Working in groups, workshop participants looked at policy document extracts on the themes of ageing, ageing in place and loneliness/isolation and responded to these. 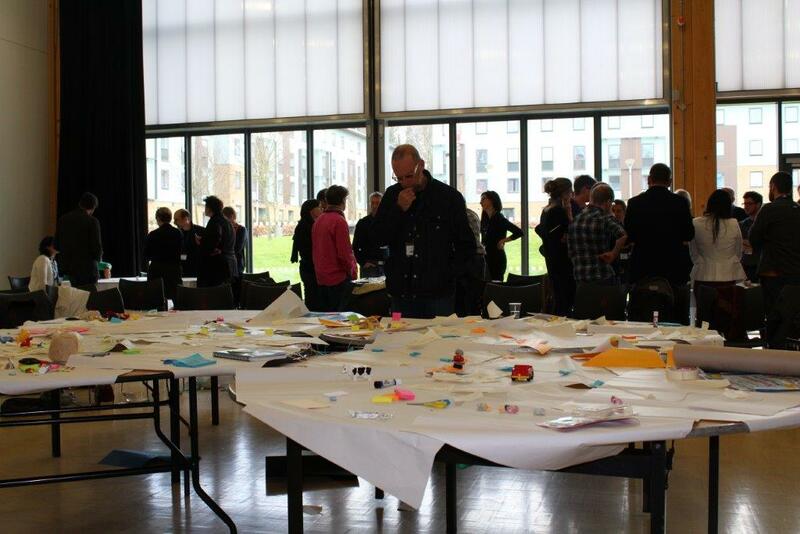 A number of themes emerged from grouping our co-designers responses to policy. These themes were then used to co-create design micro-fictions looking at 5 years, 10 years into the future and beyond, which were shared within the workshop. Further grouping of the design micro-fictions were grouped revealed a number of interesting themes (i.e. communication, transport, independent living and health economy) and technologies (i.e. 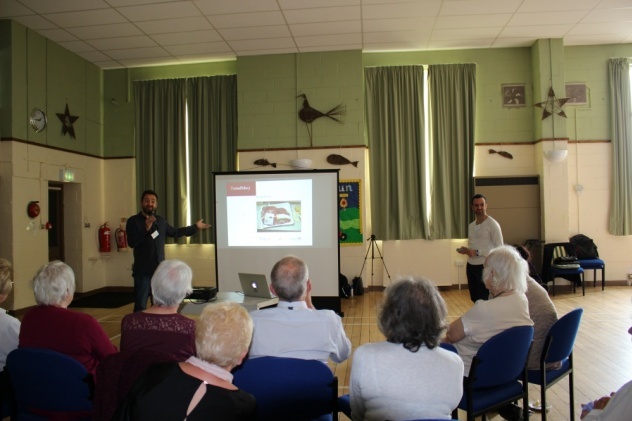 Skyping and holograms, self-drive cars, pop-up community buildings, escalators at home/garden and several more) relating to ageing in place and social isolation. 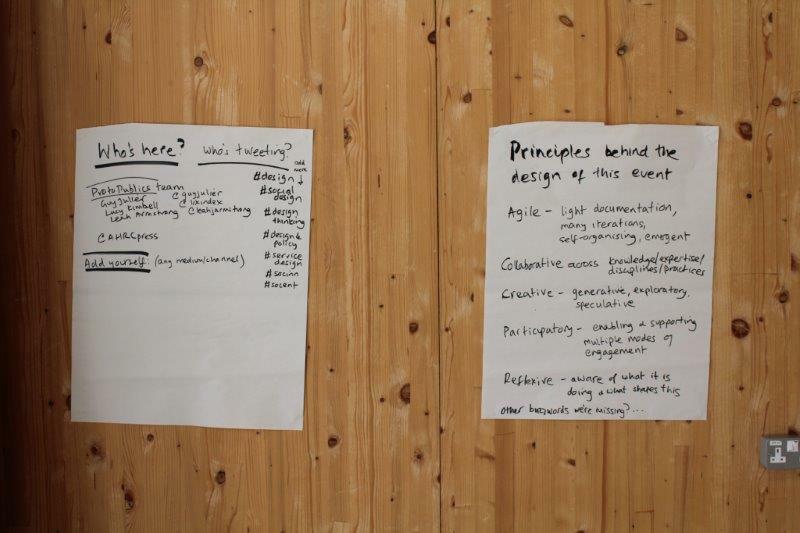 These will be explored in the next series of co-design workshops in Falmouth next week. 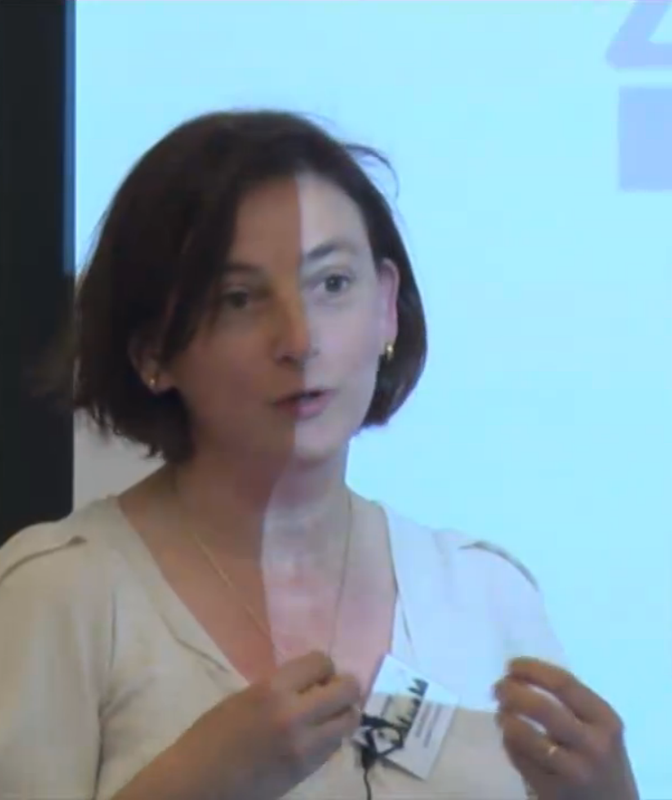 Celia Lury: Developing participation in social design: suspending the social? 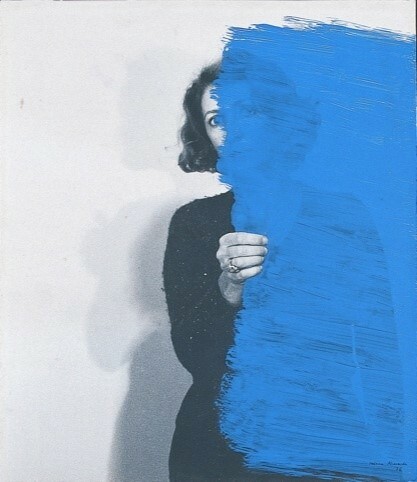 Helena Almeida, Inhabited Painting, 1975. 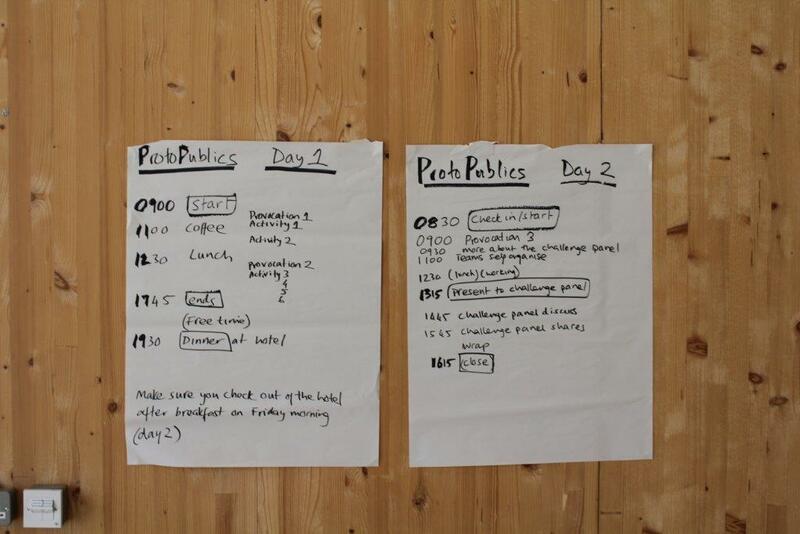 The ProtoPublics Sprint Workshop took place at Imagination Lancaster on 16-17 April. 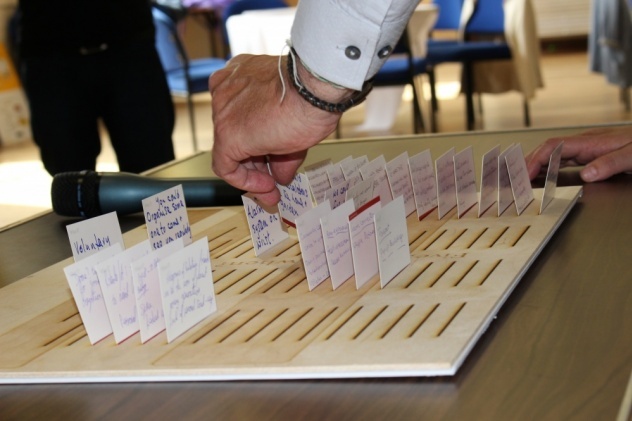 A group of 45 researchers- crossing disciplines and practices- got together to test out and explore new methods of ‘doing’ socially engaged design research. Here are some photographs to document the day. 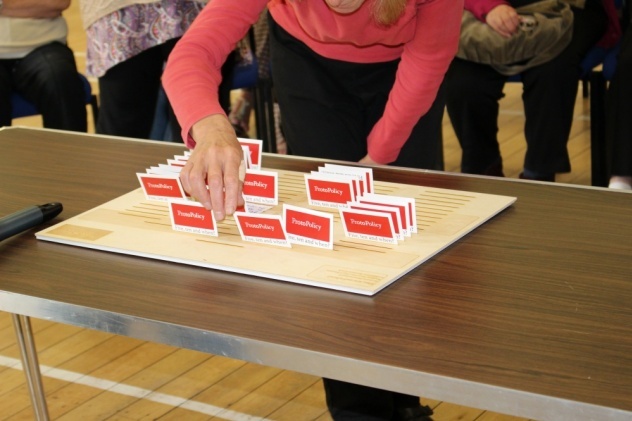 Participants were asked to arrange their ‘assets’ on the tables to connect and expand upon our core themes: mobilities; civic participation; health and well-being; public space. 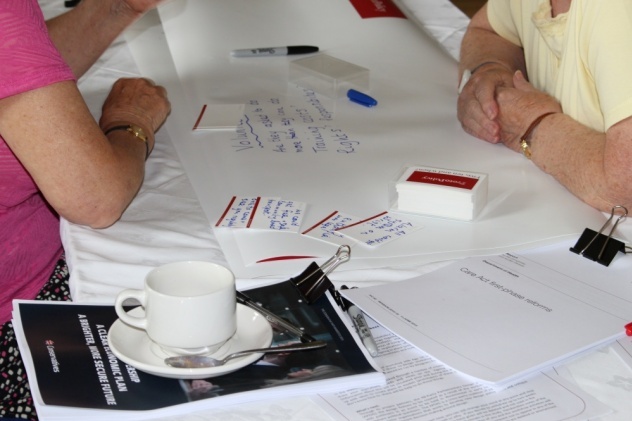 From this collection of assets, participants could identify interests, priorities and expertise of others in the workshop. From here, participants self-organised into groups to discuss common interests. They were encouraged to move between groups over the course of the two days before fixing on one group with which to put forward a research project pitch. 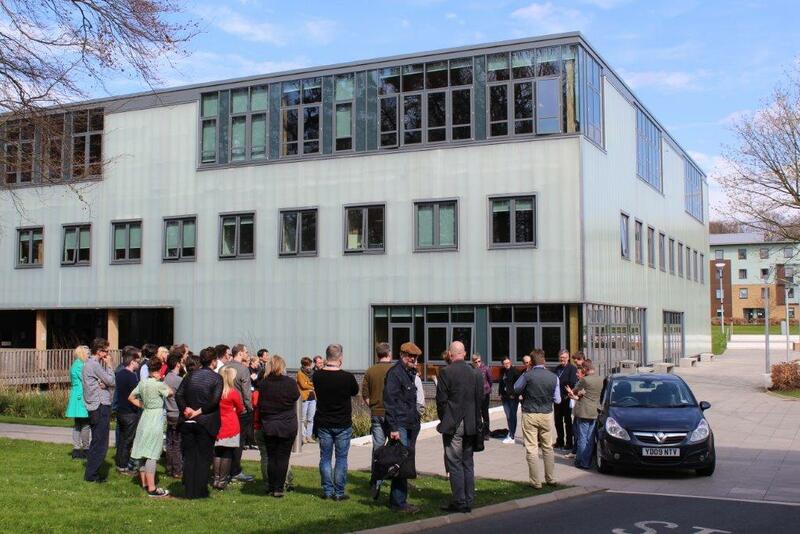 The workshop ended with creative project pitches, some of which took us outside the Imagination Lancaster building. Dr Dan Lockton, Senior Research Associate at the Helen Hamlyn Centre, RCA, reflects upon research cultures in academia and design practice, the particular approach of design in relation to behaviour change and identifies local councils and communities as groups he is particularly interested in engaging with more in his research. Monika Büscher, Professor of Sociology, Lancaster University. Q: Please summarise your current or previous research. A: My research explores the digital dimension of contemporary ‘mobile lives’ with a focus on IT ethics. Information and comunication technologies are an integral part of everyday life and often central to societies’ answers to the complex challenges of the 21st Century. Efforts to decarbonise transport and energy, improve health and well-being and enhance security often assume that more of the right information at the right time can enhance efficiency and change behaviour. Yet informational and communicative mobilities are not innocent. Based in the mobilties.lab, I combine qualitative, often ethnographic studies, social theory, and design through mobile methods, experimental, inventive, disclosive approaches, and engagement with industry and diverse publics to design IT for ‘good’. 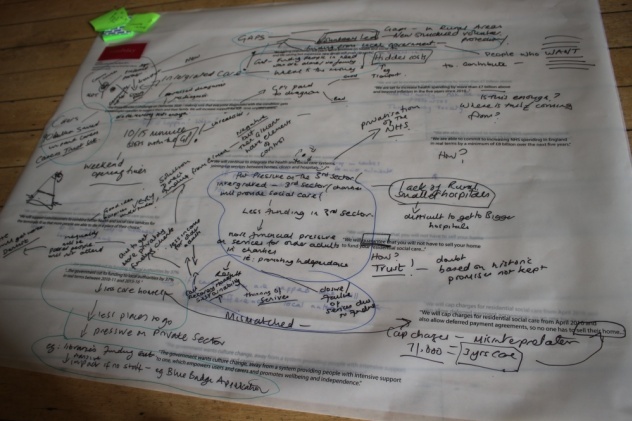 This research is interdisciplinary, experimental, engaged ‘public sociology’ that produces insights and methodologies to explore and shape socio-technical futures. I have a long- standing interest in design for design and design for ‘infrastructuring’, that is, designing in ways that enables people to make (technical, but also social, political) infrastructures ‘palpable’. My most recent research brings this perspective to the informationalization of ‘smart cities’ and disaster mobilities, which affords new forms of knowledge, command and control, public engagement, emergency planning and emergency response. Opportunities include emergent interoperability, agile and ‘whole community’ approaches, collective intelligence and data sharing, while challenges arise around data protection, privacy, social sorting, automation, technologically augmented human reasoning and action at a distance (SecInCore and BRIDGE projects). My colleagues and I are using concepts of relational ethics and cyborg phenomenology to inform innovation. 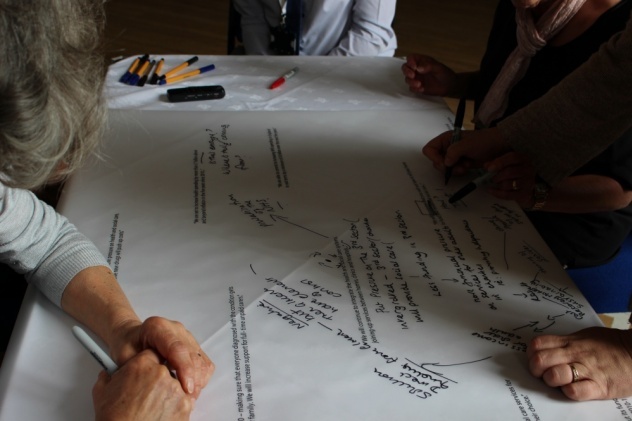 Q: Are there any groups/institutions you have not previously collaborated with but think it would be helpful to do so? to maximise the potential of IT to become part of more equal, enjoyable, effective futures, respectful of environmental, social, political, moral and cultural values. 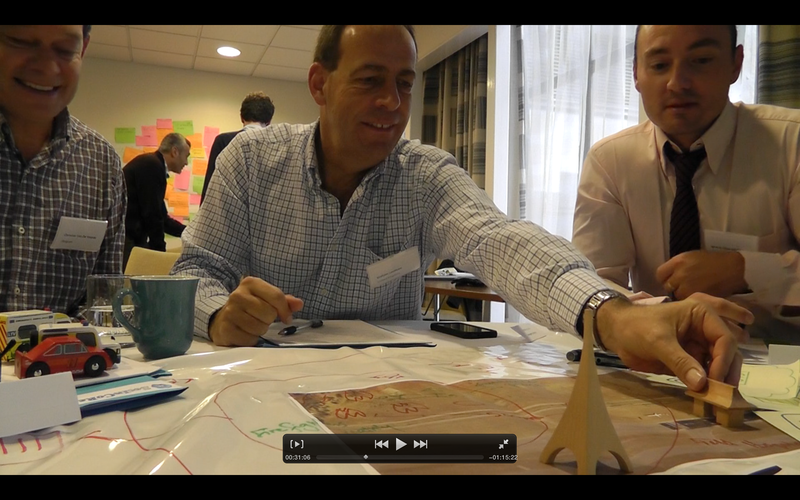 Q: How do you see design and social innovation being linked? A: Social innovation is both a source of momentum and direction for design and an important site of design in its own right. Recognising the temporal and spatial multi-sitedness of design opens up questions about expertise, knowledge, power, control, ignorance, responsibility, response-ability, located accountabilities, context, and method. It also raises questions about the object of design. My work is about designing and analysing socio-technical ‘things’ or futures – assemblies or configurations of social practices, imaginaries, technologies, material worlds, regulatory frameworks, policies. This is never-ending ‘disruptive’ innovation, inevitably accompanied by positive and negative effects, which emerge in the making and inhabiting of futures. It is one of the main responsibilities of sociological enquiry, in my view, to study and evaluate emergent future practices and effects of such reconfigurations, to fold insights into design at (ideally) all its locations, and to help to fairly put those with an interest in a position to notice, influence, at least debate, at best ‘control’ the morality of innovation. Q: What is distributed collaboration and how does it best function as a research mode? A: Distributed collaboration is a necessary mode of doing the research co-creation, collaborative design, collective experimentation, and contestation of futures that is needed to define and make innovation ‘good’. 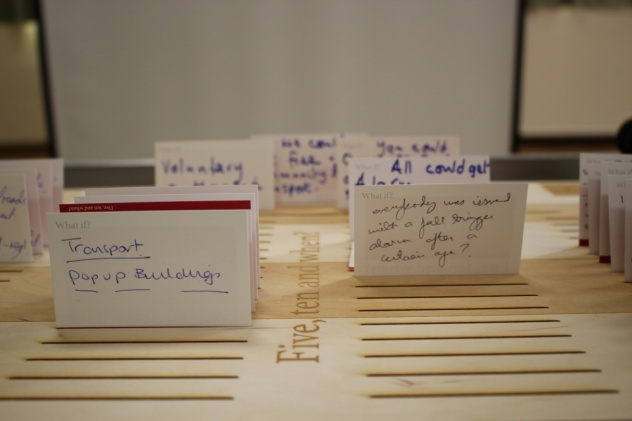 Things – analysis, design, social innovation – happen in different places and at different times. To synchronise them intensely collaborative and postdisciplinary methods are needed. Methods that bring together multiple perspectives and modes of knowledge and expertise, that disclose specific articulations of agency at different places in the system, and that enable reflective practice, experimentation and mutual learning by doing have worked best for me. They include prototyping, provotyping, living laboratories, co-design, critical, speculative design, value sensitive design, disclosive ethics, ethical and privacy impact assessment, forms of experimentation that allow multiple actors to reflectively inhabit futures. Q: What is interoperability and can it function in social design? A: Interoperability is a socio-technical concept that seems to travel across many fields. The US Department of Homeland Security recognises that ‘jurisdictions must connect technology, people, and organizations to achieve interoperability’. Interoperability may emerge as a temporary effect of the processes and practices people and organizations employ to collaborate, but it is also an effect of technical and material agency, so design and infrastucturing matters, and interoperability is not singularly benign. In the exceptional circumstances of a disaster, a commitment to connection between the multiple agencies involved may be desirable. However, when and where does the disaster stop? And who decides? How far do we allow preventative logics to shape our capacities to notice and resist surveillance? What does this do to what it means to be human, freedom and equality? 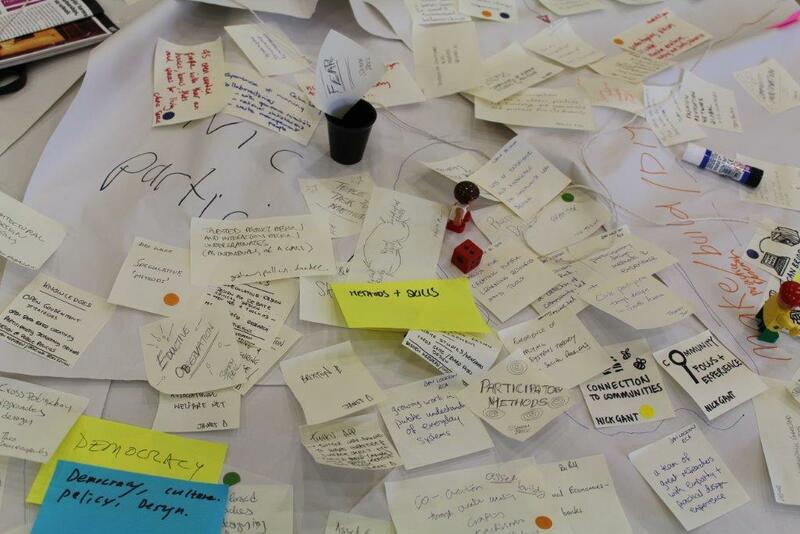 ‘Good’ interoperability between technologies, people and organizations involved in social design, design, and analysis requires concepts and policy and technology support for practices of collaboration, debate and dialog, that allow attention to frictions, multiplicities, located accountabilities, response-abilities and ways of ‘cutting the network’. Is there a question you would like us to ask another ProtoPublics participant? 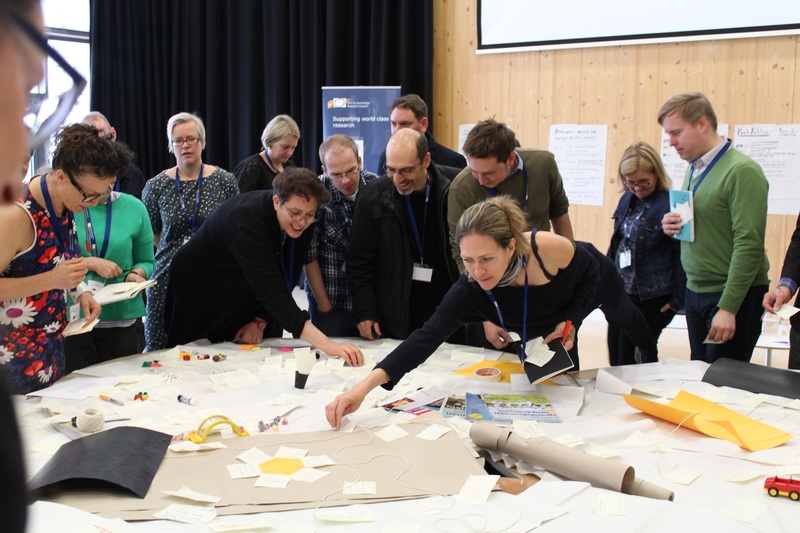 Do you ‘scale up’ your practices of research co-creation, experimentation, collaborative design to go beyond localised participatory projects to meet the ‘grand challenges’ of the 21st Century? Is it possible/necessary to design our way out of complex, global and interconnected problems like climate change and surveillance at other than local scales? If you do it, how do you do it? If you don’t why not? Bannon, L. and Bødker, S. (1997). 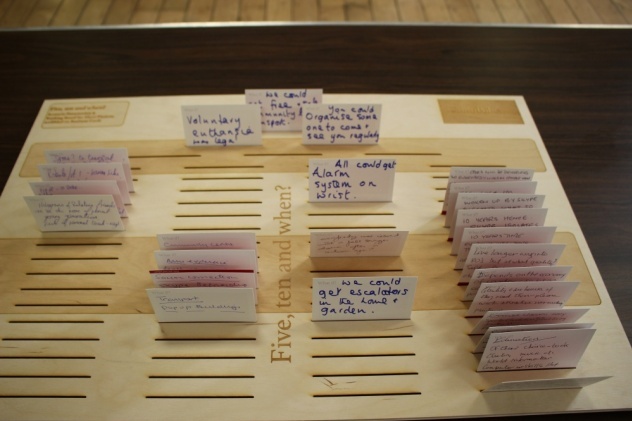 Constructing Common Information Spaces. Hughes, J. et al. (eds), Proceedings of the Fifth European Conference on Computer Supported Cooperative Work, 81-96. Kluwer. Barad, K. (2007). Meeting the Universe Halfway. Durham: Duke University Press. Burawoy, M. (2005). For Public Sociology. American Sociological Review, 70(1), 4–28. Büscher, M., Urry, J., Witchger, K. (2011). Mobile Methods. London: Routledge. Chapman, O. and Sawchuk, K. (2012) Research-Creation: Intervention, Analysis and ‘Family Resemblances’. Canadian Journal of Communication, Vol 37, No 1 (5-26). Chesbrough, H. W. (2003). Open Innovation: The New Imperative for Creating and Profiting from Technology. Boston, MA: Harvard Business School Press. Elliot, A., & Urry, J. (2010). Mobile Lives. London: Routledge. Felt, U. and Wynne, B. (2008). Taking European Knowledge Society Seriously: Report of the Expert Group on Science and Governance to the Science, Economy and … for Research, European Commission, Directorate-General for Research, Science, Economy and Society. Fuller, M. (2008). Software Studies: A Lexicon. MIT Press. Greenhough B. and Roe E. (2010) From ethical principles to response-able practice. Environment and Planning D: Society and Space 28(1) 43 – 45. Kimbell, L. (2013). An inventive practice perspective on designing An Inventive Practice Perspective on Designing. PhD Design, Lancaster University. Lancaster University. Lury, C., & Wakeford, N. (2012). Inventive Methods: The Happening of the Social. London: Routledge. Mogensen, P. (1992). Towards a provotyping approach in systems development. Scandinavian Journal of Information Systems, 4(1), 31–53. Schön, D. A. (1983). The reflective practitioner. Basic Books. Star, S,L. & Bowker, G. 2002. How to Infrastructure. In L. A. Lievrouw, L.A. & Livingstone, S.L. (eds.) The Handbook of New Media, London: SAGE, 151-162. Storni, C. (2013). Design for future uses: Pluralism, fetishism and ignorance. Nordic Design Research Conference 2013, Copenhagen-Malmö (pp.50-59). Strathern, M. (1996). Cutting the network. Journal of the Royal Anthropological Institute, 517-535. Suchman, L. (2002). Located accountabilities in technology production. Scandinavian Journal of Information Systems – Special Issue on Ethnography and Intervention Archive, 14(2), 91–105. Thackara, J. (2005) In the Bubble: designing in a complex world. Cambridge, MA: The MIT Press. Von Schomberg, R. (2013). A vision of responsible innovation. In R. Owen, J. Bessant, & M. Heintz (Eds. ), Responsible innovation. London: Wiley.